We are a smart, dynamic company of problem solvers who enjoy punching above our weight. Head quartered in the UK, you will find us solving lifting problems throughout West Africa. 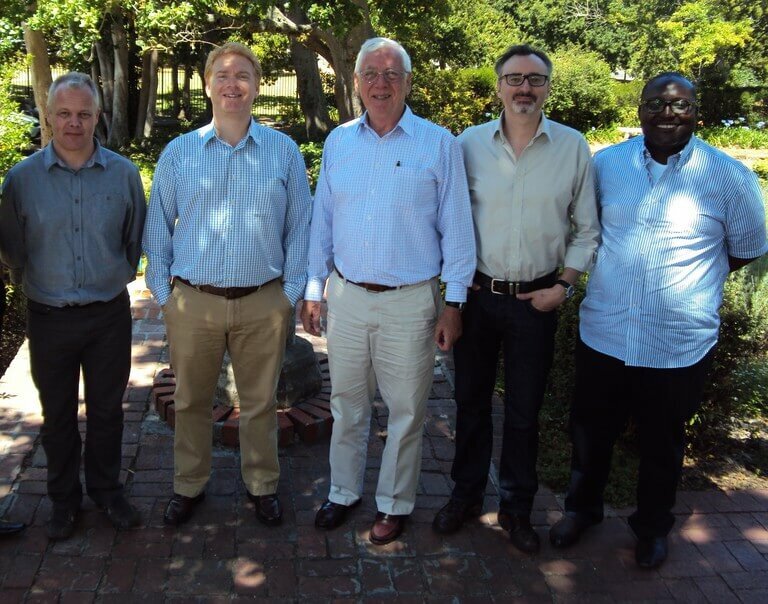 With over 60 years of experience Paterson Simons & Co. (Africa) Ltd. specialises in sales and service of lifting and handling equipment with a focus on the shipping, mining and construction industries in West Africa. We represent a number of key manufacturers and all our sales come with a full working manufacturers warranty and are backed up by a first class service team based in subsidiary offices in the region. From engineers in the field, to sales teams, parts managers, admin assistants and logistics managers (and everyone in between) you'll find us passionate about solving your lifting problems. The company's history dates back to 1821 when Rawson, Holdsworth & Co. of London and Liverpool established their company in Singapore, yet grew in acclaim due to one of the company’s early founders, one William Ker who had fostered a strong personal relationship with Temenggong of Johore, and by 1853 he had been placed in charge of the Malay ruler's finances. The relationship led to special business privileges for Ker and his partners, William Paterson and Henry Minchin Simons. The company traded in a variety of commodities, including camphor, vanilla, cinnamon, sea slugs, shark fins, tin, coffee, and pearls. In its initial years, Paterson, Simons & Co. traded in a wide range of products. It exported to Europe and other countries in the world tropical produce of all descriptions ranging from rubber and copra to pineapples from Malaya, Borneo and the East Indies. In return, it imported merchandise such as cotton goods and other manufactured products from Europe. Later, the company was active not only in the import and export trade but also acted as agents or representatives for a wide range of firms such as shipping lines, insurance companies and industrial enterprises as well as state governments. In 1888, the company's agencies included the Johore Government, New Harbour Dock, the Ben Line, Gibb Line, Union Line, four insurance companies, and the Pahang Corporation. By 1895, their agencies expanded to include the Mogul Line, the Nippon Yusen Kaisha, the Tata Line, and the Pahang Kabang. By the beginning of World War I, Paterson, Simons & Co. had become agents and secretaries for 16 planting and rubber companies and had branches in Penang, Kuala Lumpur, Klang and Port Swettenham. The partnership eventually adopted the name Patent Slip and Dock Company, but its name was changed to Paterson, Simons & Company in 1895, when Ker retired. The company re-established its port monopoly in Johore in 1899, following a merger with the Tanjong Pagar Dock Company. Six years later the port operation was expropriated by the British government, but the company retained its interests in shipping and in maritime and property insurance and continued to act as agents for the East India Coal Company and for a number of shipping lines. This company was eventually to become Paterson Simons & Co. (Africa) Ltd and incorporated in 1948, a management buy-out in 1990 saw the company into the form it is in today – a UK-based Limited company specialising in the sales, rental and servicing of heavy lifting equipment throughout West Africa. How do the various Paterson Simons companies fit together? 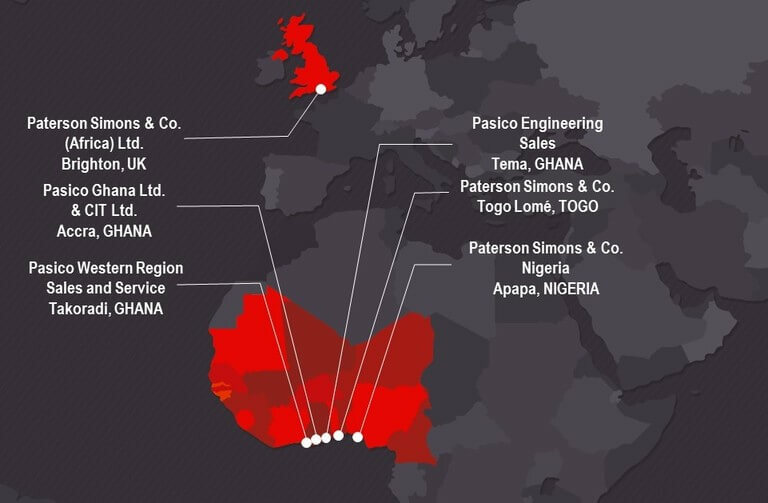 Paterson Simons & Co. (Africa) Ltd.
Head quartered and registered in the UK, and is the parent company of a number of “on-the-ground” subsidiaries in West Africa. The Ghana-based and majority-owned company that sells famous brand building materials: Naco louvred windows and Pasiguard® safety grilles. Pasico is also the Ghana-based service hub for all of the Paterson Simons lifting equipment brands with branches in Tema and Takoradi. 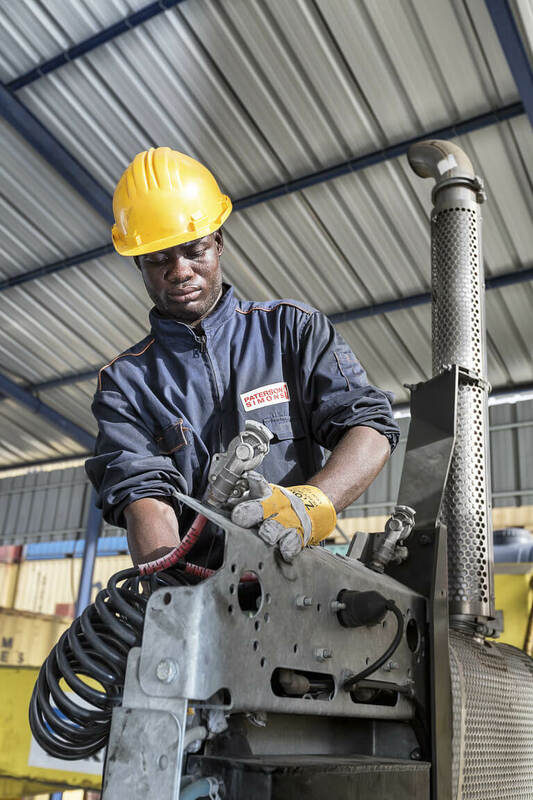 The wholly owned certification, inspection and training arm of Paterson Simons & Co. Based in Ghana, CIT offers premier safety training and inspections for all lifting equipment and can certify equipment across all major safety regulations (LOLER, OSHA, Ghana Safety Regulator, ANSI and ASME). Wholly owned Nigeria-based (Apapa) subsidiary of Paterson Simons & Co. selling and servicing lifting equipment into Nigeria. Opened in 2014, the company services the Lome Container Terminal, amongst others. Terms & Conditions for the PURCHASE of goods. Terms & Conditions for the SUPPLY of goods. Terms & Conditions for supply of SERVICES. We are looking for an experienced mobile hydraulic crane engineer to work with our local team to maintain, troubleshoot and repair the fleet of Manitowoc/Grove cranes we support as dealers in West Africa. We are looking for an experienced engineer who can work hands on and with our local team to mentor and support them. The work can consist of scheduled maintenance through to full accident rebuilds. Based in Ghana the role will also involve extensive travel around the region. -Familiarity with Manitowoc Grove product preferred although training can be provided. Interested candidates should please send a CV to recruitment@patersonsimons.com detailing qualifications and work experience. To contribute meaningfully to our clients’ productivity by selecting, supplying and supporting quality lifting equipment that is both safe and well suited to their requirements. To be excellent in our execution of this. To maintain and build on our reputation as being the market leader in West Africa for lifting equipment sales and aftermarket care. To effectively work in partnership with stakeholders including customers, employees, subsidiaries and suppliers in a transparent manner. To deliver outstanding customer care, throughout every step of the process from sales enquiry to after sales training. 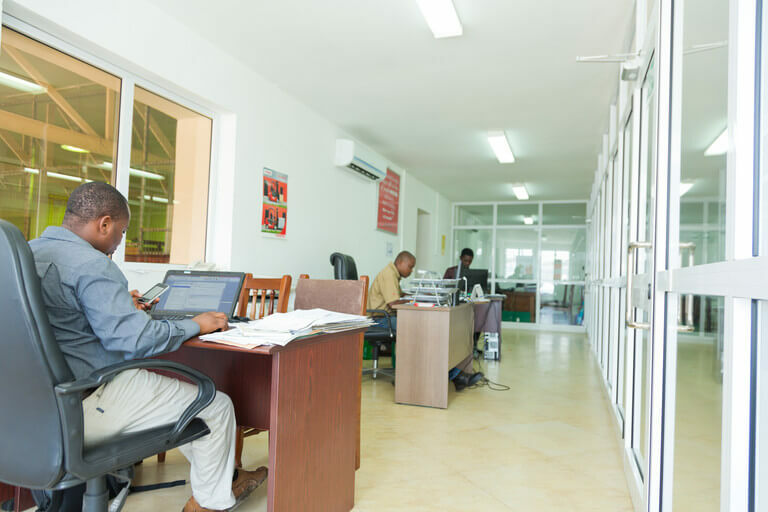 To achieve this, we commit resources to implement, maintain, and continually improve a quality management system that complies with ISO 9001:2015, which ensures we satisfy, and continue to satisfy, our clients’ requirements. To drive continual improvement by having measurable, specific objectives against which to measure and analyse and record results, and to communicate our objectives effectively through the organisation. Nous sommes une équipe dynamique et intelligente qui aime résoudre les problèmes les plus complexes. Avec plus de 60 années d’expérience, Paterson Simons & Co. (Africa) Ltd. est un spécialiste de la vente de matériel et la fourniture de services dans le domaine des équipements de lavage, avec des compétences particulières dans les domaines du transport, des mines et de la construction. Nous vendons les produits des principaux fabricants, qui bénéficient toujours de la garantie constructeur, et pour lesquels les équipes de nos filiales régionales vous apporteront un service d’assistance de haut de gamme. Des ingénieurs sur le terrain aux équipes commerciales en passant par les gestionnaires de pièces détachées, les assistants administratifs et les responsables logistiques (et tous les autres aussi) vous nous découvrirez motivés à résoudre vos problématiques de levage. Equipe de direction (de gauche à droite) : STEVE BAKER : Directeur Financier, Finances Groupe – HENRY LYNE : Président, Stratégie Groupe – EDWARD LYNE : Directeur non exécutif – JOHN TRAYNOR : Directeur Général, Ventes Groupe – KWAKU OKOH : Directeur Pasico Ghana Ltd, superviseur filiale Ghana. L’origine de la société remonte à 1821 quand Rawson, Holdsworth & Co. de Londres et Liverpool s’est installé à Singapour, et a connu un succès grandissant grâce à l’un de ses plus anciens fondateurs, William Ker, qui avait créé une relation forte avec Temenggong de Johore qui, en 1853, pris en charges la gestion des finances du souverain de Malaisie. Cette relation a engendré des privilèges commerciaux pour Ker et ses partenaires, William Paterson et Henry Minchin Simons. La société a pratiqué le commerce de plusieurs produits, dont le camphre, la vanille, la cannelle, les limaces de mer, les ailerons de requin, l’étain, le café et les perles. Lors de ses débuts, Paterson Simons & Co. pratiqua le commerce de nombreux produits variés. La société exportait vers l’Europe et le reste du monde des produits tropicaux de toutes sortes, du caoutchouc et du copra à l’ananas, provenant de Malaisie, de Bornéo et des Indes orientales. Et inversement elle importait des produits d’Europe tels que le coton. Plus tard, la société continua son activité d’import-export mais devint aussi agent ou représentant local pour de nombreux types d’entreprises tels que les compagnies maritimes, les compagnies d’assurance, les industries ou encore les gouvernements. En 1888, la société représentait notamment le gouvernement de Johore, New Harbour Dock, Ben Line, Gibb Line, Union Line, quatre compagnies d’assurance et Pahang Corporation. En 1895, la société représente également Mogul Line, le japonais Yusen Kaisha, Tata Line, et Pahang Kabang. Avant le début de la première guerre mondiale, Paterson Simons & Co était devenu l’agent de 16 entreprises de plantation et de caoutchouc et avait des succursales à Penang,Kuala Lumpur, Klang et Port Swettenham. Le partenariat pris un temps le nom de Patent Slip and Dock Company avant d’être changé en Patersons, Simons & Company en 1895 quand Ker pris sa retraite. La société a rétabli son monopole portuaire à Johore en 1899 suite à la fusion avec la société Tanjong Pagar Dock Company. Six ans plus tard, l’exploitation fut expropriée par le gouvernement britannique, mais la société a conservé ses intérêts dans le transport maritime, l’assurance maritime et immobilière et continua à représenter East India Coal Company ainsi que plusieurs compagnies maritimes. La société devint Paterson Simons & Co. (Africa) Ltd en 1948, et un rachat par les membres dirigeants en 1990 transforma la société en ce qu’elle est toujours à ce jour, une société britannique spécialisée dans la vente, la location et l’entretien de matériel de levage de charges lourdes à travers l’Afrique de l’Ouest. Société enregistrée et ayant son siège social au Royaume-Uni, c’est la société mère des filiales présentes « sur le terrain » en Afrique de l’Ouest. Il s’agit de la société basée au Ghana et détenue majoritairement par la société mère, qui vend des matériaux de construction des marques les plus célèbres : fenêtres Naco et grilles de sécurité Pasiguard ®. Pasico est également centre de service basé au Ghana pour toutes les marques d’équipement de levage de Patersons Simons avec des succursales à Tema et Takoradi. Il s’agit d’une filiale à 100% de Paterson Simons & Co. , dédiée à la certification, l’inspection et la formation. Basée au Ghana elle propose des formations de premier ordre en matière de sécurité ainsi que l’inspection de tous les équipements de levage qu’elle peut certifier au titre des principales normes de sécurité ( LOLER, OSHA, Ghana Safety Regulator, ANSI et COMME MOI). 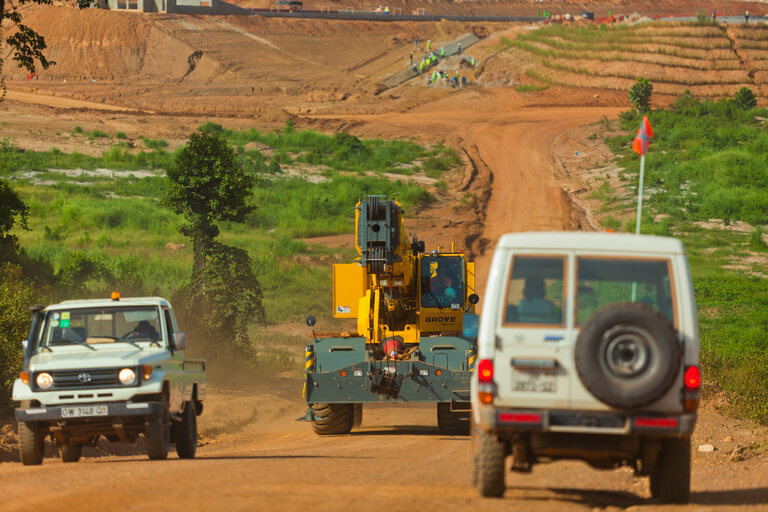 Filiale à 100%de Paterson Simons & Co. et basée au Nigeria (Apapa), elle vend et entretient des équipements de levage au Nigeria. Créée en 2014, l’entreprise dessert entre autres le Lome Container Terminal. Conditions générales relatives à l’achat de marchandises. Conditions générales relatives à la fourniture de marchandises. Conditions générales du service des ventes. Il n’y a aucun poste actuellement annoncé. Contribuer de manière significative à la productivité de nos clients en sélectionnant, fournissant et apportant un support en matière d’équipements de levage de qualité, à la fois sûrs et adaptés à leurs besoins. Être excellent dans nos réalisations. Maintenir et renforcer notre réputation de leader sur le marché de l’Afrique de l’Ouest en matière de vente d’équipements de levage et de support après-vente. Travailler efficacement en partenariat avec toutes les parties prenantes, à savoir les clients, les employés, les filiales et les fournisseurs, et ce de façon transparente. Fournir un service client exceptionnel à chaque étape du processus, de la demande avant-vente à la formation après vente. Pour cela, nous engageons des ressources pour mettre en œuvre, maintenir et améliorer continuellement un système de gestion de la qualité conforme à la norme ISO 9001: 2015, qui garantit que nous répondons et continuons à répondre aux exigences de nos clients. Nous améliorer continuellement en ayant des objectifs quantifiables et spécifiques permettant de mesurer, d’analyser et d’enregistrer les résultats, et de communiquer efficacement nos objectifs au sein de l’organisation. © 2018 Paterson Simons & Co. (Africa) Limited. Tous droits réservés.